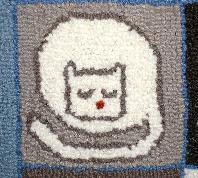 Where are all the hooked rugs? 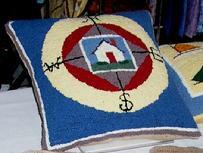 At Off Soundings Design we love designing and hooking decorative and useful items for the home. Most people naturally associate wool hooking with rugs, and while creating the occasional rug is not out of the question, we prefer to make smaller items like pillows, tea cozies, draft stoppers, chair pads and the like. We even invented something entirely new: the hooked trivet surround. (At least we think it's never been done before--we'd never seen one!) These items are still made with fine materials and traditional craftsmanship but are more affordable. Perfect for people who appreciate unique, artisan quality throughout their homes. Below we offer a sampling of some of our singular creations, with a close-up look so you can see the detail. And it's the detail that makes all the difference. The wool we use is cut into fine strips just 1/16" wide to give a richer, more textured look than wider strips would offer: the contrast between using a small camel's hair brush or a house painter's brush on your canvas. To view our collections, just use the menu on the left-hand side of the screen. Home is Best Pillow--16x16 in. 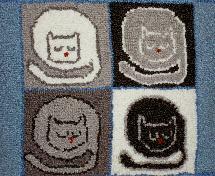 Foursquare Cats Pillow--14 x 14 in. 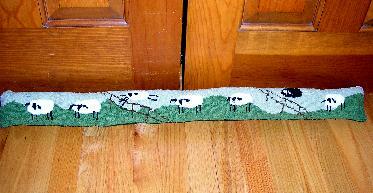 Flock of Sheep Pillow--12x12 in. All our pillows are stuffed with new polyfil. The backing fabric will vary depending on the palette of the hooked canvas. For example, the Flock of Sheep pillow is backed with a soft light taupe to complement the colors of the sheep. The Pineapple pillow is backed with a velvety fabric, with a sculpted leafy pattern, in an olive green that picks up the various greens on the front. If you have any questions, please email! Surrounded by mice, our cat decides to regroup and take a nap! Hard to fit all those mice into one photo!